Today we have a guest post from one of our awesome partners Wiser! Not many eCommerce companies know what sort of technology is available out there that can help the bottom line, here we highlight the importance of having Dynamic Pricing. The eCommerce is growing quickly into a $1.5 trillion industry. This means that competition is fierce and one of the keys to differentiation is pricing strategy. Online retailers have been hit hard by the loss leading strategies of giant competitors like Amazon and Wal-Mart, but dynamic pricing can help retailers optimise for profit without having to constantly drop prices. Price matching is not a good option for most retailers, but about 50% of retailers include it in the fine print. No retailer wants to be dragged into a price war because it can drive down profits and revenue with little to nothing gained. These price wars can take a toll on perceived brand value because of inconsistent pricing, especially for smaller retailers. While retail giants might have the upper hand due to size, one thing they are doing right that retailers of all sizes should emulate is implementing a dynamic pricing strategy that incorporates competitive monitoring. Price matching can sometimes be a slippery slope, but competitive monitoring still holds value from a pricing and merchandising perspective. Even if you’re not necessarily looking to have the lowest price, relative price matters. For example, you may want to maintain pricing within a certain percentage of your top competitor. A sound pricing strategy that is able to automatically respond to fluctuations in the market optimises profit and revenue. 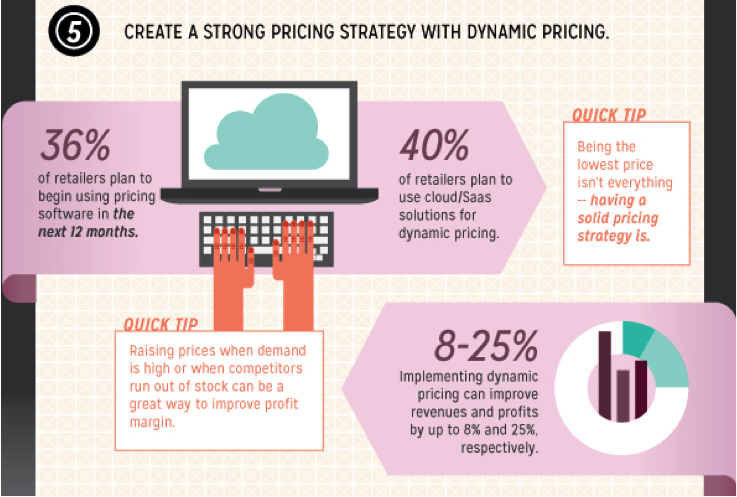 Dynamic pricing can help online retailers do just that. It’s a flexible pricing strategy that businesses use to price and reprice products to adapt according to their own internal sales data, changes in the market and other external factors. In order to output effective prices, they must utilise data that will tell them things such as how much competitors are selling the product for as well as monitor demand. This means that when conversions are low, your business automatically lowers product prices to boost them up. Another possibility is that in times when demand is high or a competitor runs out of stock, your company would raise prices to take advantage. Online retailers worldwide use this strategy because it can maximise both sales and profit. Some retailers are able to implement a dynamic pricing strategy in-house, but for many it is too time consuming and technical. Amazon reprices its products every 10 minutes or even more often, while Best Buy and Wal-Mart change their prices an upwards of 50,000 times per month. This is in stark contrast to the 45% of retailers who think they only need to change their prices once a week. Repricing like the industry leaders would be nearly impossible for smaller retailers and that is why 22% of retailers use pricing software to automate the process. Showrooming and webrooming are on the rise. The former phenomenon is when shoppers look at products in stores and then buy them later online for a cheaper price. The latter is when shoppers research products online, but opt to buy them in store instead. Forty-six percent of shoppers said they have showroomed and 69% reportedly webroomed. Both are slated to increase due to the skyrocketing use of mobile devices. Combined with increasing price transparency and the rise of comparison shopping engines, it’s more important than ever to be able to intelligently reprice in real-time. Dynamic pricing is an unparallelled opportunity to boost profits in the ever changing and hyper competitive online retail landscape. Retailers that decide to implement a dynamic pricing strategy on average see an 8% increase in revenue and a 25% increase in profit. Many retailers are catching on to the importance of dynamic pricing, as 36% of retailers report that they plan to start using pricing software in the next 12 months. 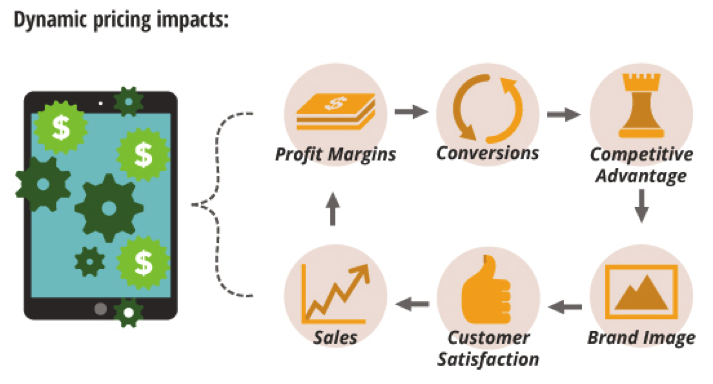 The future of ecommerce will be based on utilizing big data to price for profit. Big data is more than the latest buzzword. In fact, it is crucial to mining and implementing the best pricing strategy. At Silicon Valley Comes to Oxford 2013, Michael Chui, a big data expert of the McKinsey Global Institute, came to the conclusion that, “The use of data and analytics in general is going to be a basis of competition going forward… Those companies that are able to use data effectively are more likely to win in the marketplace.” The 22% of retailers who already use pricing software have a head start and are able to compete effectively in the marketplace. How will you prepare your company’s pricing strategy for the future of eCommerce? Arie Shpanya is the Founder & CEO of Wiser, a dynamic pricing engine that lets retailers intelligently monitor product pricing, analyse in-depth price history analytics, compare pricing strategy to competitors, and compete wisely by re-pricing products in real-time. This entry was posted in OME News & Tips and tagged dynamic pricing, ecommerce, pricing competition, pricing strategy, showrooming, webrooming, wisepricer. Bookmark the permalink.